Trapped on the high mountain ledge of their ancestors, 75 Apache warriors jump to their death. They would rather take this leap than be killed by the U.S. troops surrounding them. The Legend of Apache Tears is well known to the San Carlos Apache of Arizona, who like all indigenous people have a long history of defending their land, spirituality and culture against colonization. This resistance movement has not ended for the Apache, more than 100 years after the Apache Leap. Five miles from that historic mountain ledge is an ancient holy place. The Chiricahua Apache from the San Carlos reservation call it Chich’il Bildagoteel. In English, it is known as Oak Flat. Chich’il Bildagoteel is today threatened by a massive mine proposed by Resolution Copper, a subsidiary of Rio Tinto. The San Carlos reservation was established in 1872, and was originally known as “Hell’s Forty Acres” because of the horrific health and environmental conditions there. President U.S. Grant designated the reservation for Chiricahua Apache and Yavapai bands. The originally nomadic groups, whose ancestral livelihoods were oriented by the seasonal movement of buffalo, were now trapped on a tiny piece of land. Many warriors fought tirelessly against the invading forces. One prominent warrior named Lozen, who was also a medicine woman and sister of Apache leader Victorio, dedicated her life to protecting her people. By the time she was born in 1840, American forces had already begun paying bounties for the scalps of her relatives. Lozen is known in oral tradition to have been given special abilities to sense the locations of enemy forces while praying to the Creator, Ussen, for guidance. She helped lead an escape out of the San Carlos reservation in 1877, and is known for her unrelenting bravery, skill, and dedication to her people throughout this journey. Geronimo and Cochise are two more of countless warriors who fought for the freedom and protection of their people. In 1955, President Dwight D. Eisenhower decreed the area of Oak Flat closed to mining. He designated the surrounding area public land under the multiple-use mandate of the U.S. Forest Service. In 1971, those regulations were reaffirmed. Since then, this land has been visited and cherished by its ancestral peoples and recreational visitors alike. It wasn’t until 2014—when the late Senator John McCain and a few collaborators attached a fine-print rider to a must-pass military spending bill—that the public ownership of Oak Flat came into question. McCain’s rider promised the land to Rio Tinto, a top contributor to McCain’s campaign during that same year. The National Defense Authorization Act was 1,600 pages long. With only one hour to review the document, members of Congress scrambled to decipher McCain’s stealth rider. Leah Millet of the New York Times called this move: “An impressive new low in congressional corruption” (2015). Founded in 1873, Rio Tinto is an Anglo-Australian multinational metals and mining corporation. It has become one of the world’s largest companies, grossing $40 billion (US) in sales in 2017. (https://www.statista.com/statistics/272615/rio-tinto-revenue-since-2001/). Since Rio Tinto opened its original mine complex in Spain, a long series of mergers and acquisitions have grown the company into a global giant. It is now a main producer of many of the Earth’s exploited commodities, including aluminum, iron ore, uranium, copper, coal and diamonds. Rio Tinto has operations on six continents, but is concentrated mainly in Australia and Canada. Its head offices are located in London and Melbourne. Resolution Copper is a Rio Tinto subsidiary focused on mining for copper beneath Oak Flat. Resolution Copper plans to exploit what is regarded as the largest copper deposit in North America. This deposit, perhaps not coincidentally, lies underneath the sacred lands of Chi’chil Bildagoteel, roughly 50 miles east of Phoenix, Arizona. Resolution Copper is proposing a method called “blockade mining” to extract the ore. This would involve blasting a giant cavity underneath the copper deposit. The void created would allow copper to fall into carts, which would transport the ore up to the surface. Through this process, an estimated 1.6 billion tons of toxic mine waste would be produced. After the mining is finished, a hole as deep as the Eiffel Tower is high would be created in the Earth’s surface, where the canyons, forests and springs at Oak Flat now lie in peace. The resistance against Resolution Copper, known as The Apache Stronghold, has been creative and relentless. This multi-pronged effort has allies working across political, grassroots, artistic, nonprofit and media spheres. The original occupation of Oak Flat in 2014 has cascaded into a movement around the country, including solidarity marches, presence at large conferences such as Bioneers, public speak-outs against the land exchange, media production and lobbying. The Apache Stronghold has not been met only with peace and solidarity, though. On March 17, 2018, for example, a member of The Apache Stronghold arrived at Oak Flat to find four sacred crosses intentionally destroyed. Two of the sacred ritual symbols had been ripped from the ground, and another two were destroyed, but left in place. This is just one example of the many intimidation strategies heralded by opposing forces—both corporate and civil. 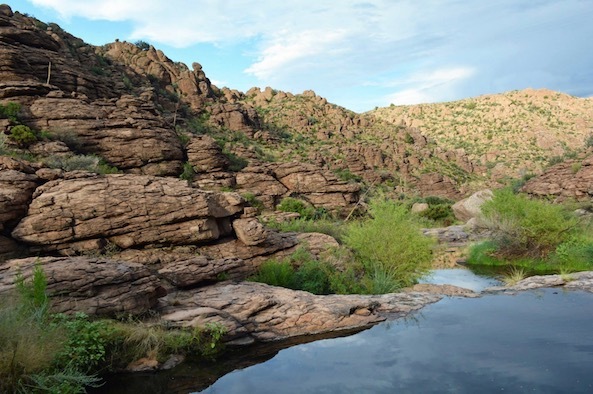 Roger Featherstone, an environmentalist who works with the San Carlos Apache to protect sacred sites, has observed that the most ecologically pristine areas also tend to be the most sacred places. Featherstone asserts “we cannot separate sacredness from ecology.” It’s in this spirit that we should all recognize how connected we are to the struggle to protect Oak Flat.